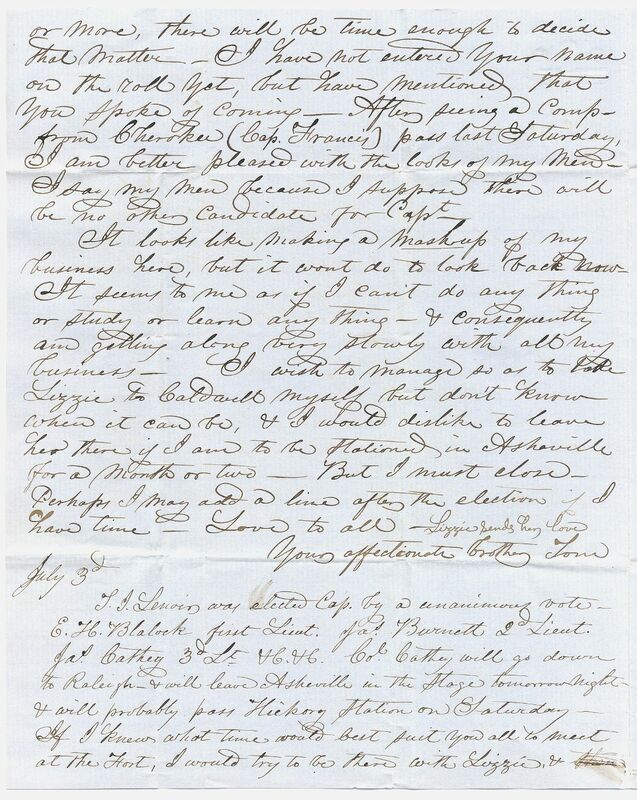 Item description: Letter, 2 July 1861, from Thomas Isaac Lenoir to Walter Waightstill Lenoir about raising a volunteer company. Item citation: From folder 145 of the Lenoir Family Papers #426, Southern Historical Collection, Wilson Library, University of North Carolina at Chapel Hill. Our volunteer Company meets this morning at 10 O’clock to drill & elect Officers — If you still think of going with us, I wish you could be here. We now number seventy one & will probably be increased some today — We will be apt to start somebody (maybe Col. Cathey) to Raleigh this evening if he can get off in time to reach Asheville tonight, that he may go on in the Morganton Stage tomorrow, to offer the services of the Company to the Gov – get commissions, instructions, &c.
If he gets off today he will, I suppose, pass Hickory Station on Thursday. I suppose we will be ordered to Asheville for the present. I wrote to Bro. 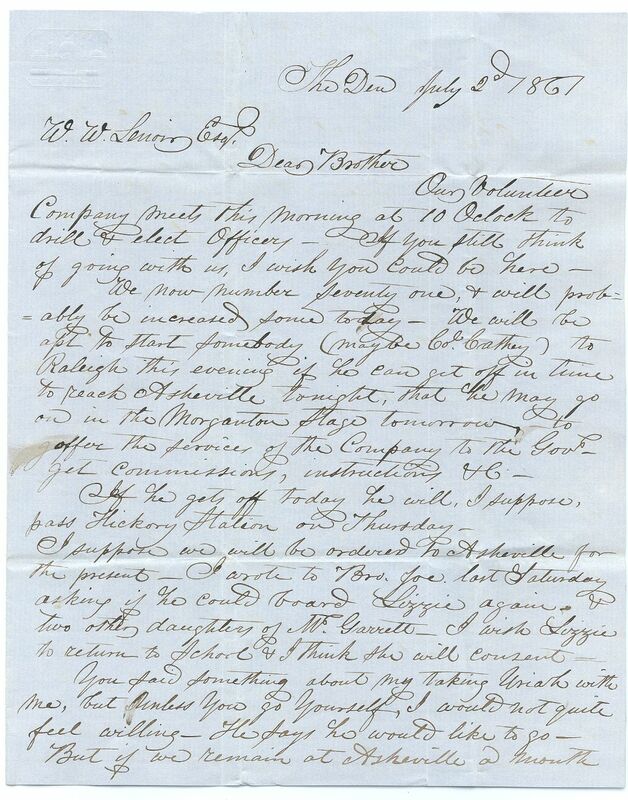 Joe last Saturday asking if he could board Lizzie again, & two other daughters of W. Garrett. I wish Lizzie to return to school & I think she will consent. You said something about my taking Uriah with me, but unless you go yourself, I would not quite feel willing. He says he would like to go. But if we remain at Asheville a month or more, there will be time enough to decide that matter. I have not entered your name on the roll yet, but have mentioned that you spoke of coming. After seeing a Comp. from Cherokee (Cap. Francis) pass last Saturday, I am better pleased with the looks of my men. I say my men because I suppose there will be no other candidate for Capt. It looks like making a mashup of my business here, but it wont do to look back now. It seems to me as if I can’t do any thing or study or learn any thing, & consequently am getting along very slowly with all my business. I wish to manage so as to take Lizzie to Caldwell myself but don’t know when it can be, & I would dislike to leave her there if I am to be stationed in Asheville for a month or two. But I must close. Perhaps I may add a line after the election if I have time. Love to all. Lizzie sends her love. T.L. Lenoir was elected Cap. by a unanimous vote. E.H. Blalock first Lieut., Jas. Burnett 2 Lieut., Jas. Cathey 3d. Lt., &c., &c. Col. Cathey will go down to Raleigh & will leave Asheville in the stage tomorrow night & will probably pass Hickory Station on Saturday. If I knew what time would best suit you all to meet at the Fort, I would try to be there with Lizzie, & then leave here at school. Do you still think of joining our company? If I go to Caldwell & if you could be ready, I could bring you back instead of Lizzie. Are there any other men in Caldwell that would join our Company. What did Mr. Bryce[?] say about the price of those books? Some of the men here want the copy which you sent to me, & I don’t know what to charge. I left 5.00 with W.B. It is probable that I will employ A.C.[?] Hartgrove to pay some attention to my affairs here. He says that he could probably come one day in each week, but I have made no argument with him yet. I have got no pistol as yet. Do you know of any good ones to be had? Write soon & as often as convenient. 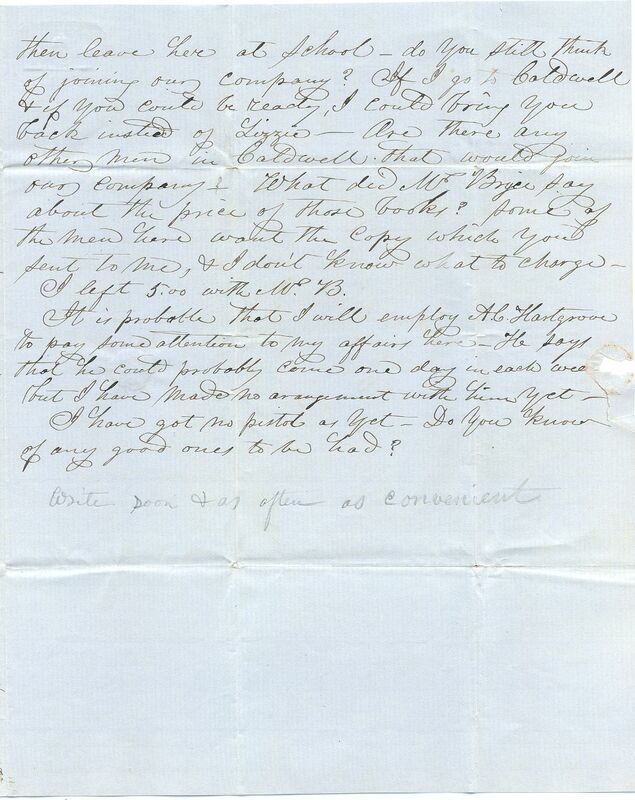 This entry was posted in Southern Historical Collection and tagged Lenoir family, Mary Elizabeth Garrett Lenoir, mobilization, Thomas Isaac Lenoir, Walter Waightstill Lenoir. Bookmark the permalink.